Jamaican bobsled team qualifies for Sochi, but needs $80K fast! 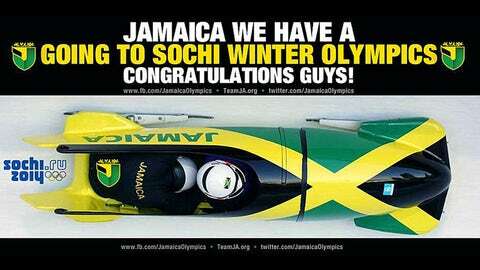 #BREAKING: Jamaica's 2 man Bobsled qualified for Winter Olympics in Sochi . CONGRATULATIONS!!!! The Jamaican two-man bobsled team, led by 46-year-old Winston Watts, has earned itself a ticket to the Olympic Games in Sochi, Russia. Watts and brakeman Marvin Dixon advanced through qualifying races in St. Moritz. That is, if they can afford it. Funding is a serious problem and sled driver Winston Watts told The Associated Press on Saturday that he’s trying to raise as much as $80,000 in the next couple weeks to cover travel and equipment costs. "Right now," Watts said, "we’re at zero." The trip marks the return to Olympic competition after a 12-year absence. This one, though, has been more of a test, off the course. The team is not being supported by Jamaica. Qualifying doesn’t seem to guarantee an appearance at the 2014 Games, though. The team could be short on funds. “In truth, we still don’t really know at the moment if we’d even have enough funds or sponsorship to fly to Sochi itself for the Games itself,” Watts told the Telegraph. “It all depends. Our families need to be taken care of first. If there’s no funding, who knows? The team is actually accepting donations through this website.